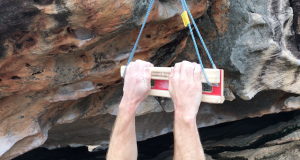 Getting your fingers warm can be difficult at some climbing locations, especially if the rock is steep. 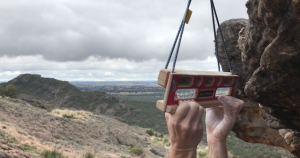 Pulling on before a good climbing warm up can increase the chances of an injury, and without some friendly jugs around this can be difficult. 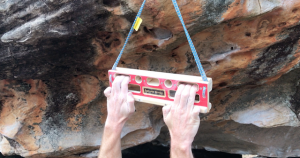 I’ve been trialling the Awesome Woodys Cliff Board Micro for a little while now and found it perfect in this situation. 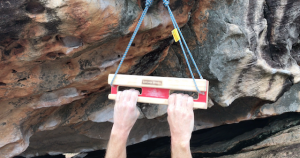 It is also a great training board if you rent, or are on the move a lot as it is super small and really versatile. 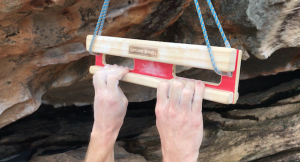 Awesome Woodys are nice enough to supply a 10-minute workout with their boards that is perfect for getting your fingers ready to crush, so I’ve turned this into an interval timer that you can carry with you wherever you go (you can also use any of our other fingerboard programs as well). 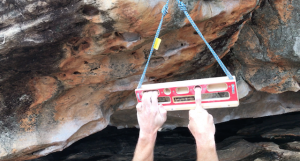 The routine is very straightforward but does get more difficult as you go on, so do go into it completely cold. 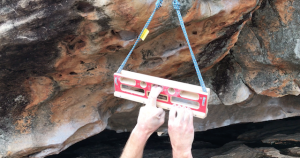 Start by finding a good place to hang your board safely and get to work, the following exercises are performed in sequence every minute on the minute. Flip the cord to do the next lot of exercises on the other side of the board. Have a good shake out and rest for 5-10 minutes and you should be ready to go!